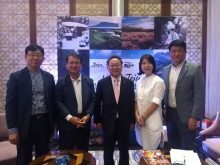 Jeju Special Self-Governing Province and Jeju Tourism Organization recently held a joint roadshow in New Delhi and Mumbai to present the destination to travel agents. This was their second tourism presentation in India since 2015 when they made their India debut. Park Hong Bai, President, Jeju Tourism Organization, led the Korean delegation that comprised Jeju Special Self-Governing Province and three domestic businesses that were participating in the roadshow. About 100 tour operators attended the show in each city. Indian nationals do not require a visa for visiting Jeju Island.